On Saturday, June 21st, The Dollicia F. Holloway Memorial Foundation, Inc hosted their very first 8K Walk-A-Thon. The theme of the event was entitled “Walking Towards a Brighter Future.” The section set for the Walk-A-Thon had a few corporate sponsors, some volunteers and a great turn out of participants, both young and seasoned walkers, who were ready to make their mark by walking around the beautiful waterfront Long Island Park in Nassau County to help sponsor a college bound High School senior on her way to Rutgers University. 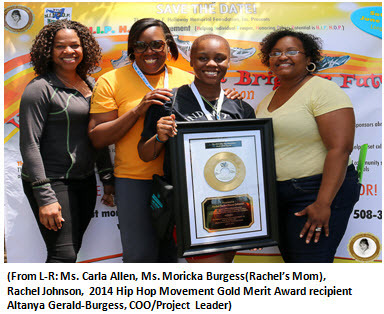 Ms. Rachel Johnson, 18, a high school graduate and valedictorian of her class at Abundant Life Academy, out of Nutley, New Jersey, was the very first recipient of the Foundation’s Youth Educational Initiative, The Hip Hop Movement 2014 Gold Merit Award. 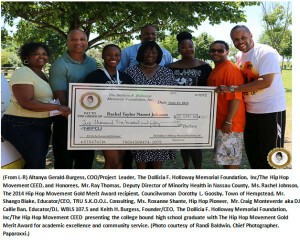 The award was created to allow the student’s community and various corporate sponsors to get involved with assisting college bound high school seniors to raise an unlimited amount of funds to offset their college expenses and also enable, equip and empower students once they graduated to encourage them to come back and enhance the community which assisted them in obtaining their college degrees. Corporate Sponsors, such as Fidelis Care, Bethpage Federal Credit Union, Better Magazine, Health First, Modell’s Sporting Goods, Starbucks, BJ Wholesale Club, Shoprite and S.J. Edwards and Associates, as well as private community sponsors and donors loaned their support to the 8K Walk-A-Thon, which will be held annually by the Foundation’s Youth Educational Initiative, the Hip Hop Movement Community Enrichment and Economic Development Program. Burgess says, “My definition of HIP HOP has always been “Helping Individuals Prosper & Honoring Others Potential.” Moricka Burgess was so grateful for all of the kindness and opportunity extended to her daughter, she wanted to thanked the Hip Hop Movement for putting education at the forefront of all they do.